Hyundai will re-engineer its forthcoming 3 door Veloster coupe specifically for right-hand drive markets, a Hyundai source has confirmed. The Hyundai Veloster – a replacement for the soon to be discontinued Hyundai Coupe – has three physical hinged doors, similar in concept to the Mini Clubman but unlike the Mini, Hyundai will change the design for RHD markets despite the huge cost of retooling involved. “There are some big markets out there for RHD such as the UK and Australia so it will be worth the cost of re-engineering,” said the source. “It’s going to be quite innovative in the way it’s laid out.” First seen at the 2007 Seoul motorshow, the Veloster is Hyundai’s answer to the Volkswagen Scirocco. It is a similar size to the Scirocco, measuring 4,285mm long and 1,790mm wide, and will share much of its platform with the front-wheel drive i30 hatchback. Internally, Hyundai describe the Veloster as a “compact utility vehicle; a stylish coupe with hatchback practicality.” The 2+2 Hyundai Veloster’s flagship engine will be the 168bhp 1.6-litre turbocharged 4 cylinder petrol engine, complete with stop-start technology and direct fuel-injection. 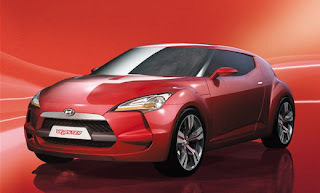 The Veloster will go on-sale in the UK at the beginning of 2011 with prices set to start at around £18,000.